We recently decided to develop an open source preset librarian for TimeLine and Mobius. Our main goal was to assemble the infrastructure for an extendable librarian that could be customized and tweaked by developers in many different ways. We’ve just finished putting together this initial version, which will allow TimeLine and Mobius users to organize and back up their presets, when connected to a Mac or PC via a MIDI to USB converter. So, for the non-coder, you can go right ahead and use this version and access basic organization and back up functionality. We plan to make updates in the future, in parallel with any open source developers that choose to come on and work on their own versions. If you have any issues with the software, please feel free to email us at support@strymon.net. Thanks! Are you planning to implement a visual preset editor on top of this? Thank you!! Now backing up configs and exchanging with friends will be much easier. Why didn’t you specify Windows 8? Would it not work with it? So glad this has been released. I’ll use it every week at the very least! I’m sooo excited for this, but can’t get it working!!! So frustrating! I’m using a new iMac 27″ running OS X (10.8.3) and the M-Audio UNO MIDI Interface. When I start SPL and select “USB Uno MIDI Interface” from the MIDI Settings dialog box (as per the instructions) and click the Test button it just says “unknown”. Why won’t it connect!? Is anyone else having issues? 1. Make sure you have the latest UNO drivers installed. 2. The ins/outs are confusingly labeled on the UNO. Make sure you have “To OUT” connected to the device OUT and “To IN” connected to the IN. 3. Click the TEST button in the librarian software. Do any of the little green LEDs on your UNO blink? 4. Do you have any other audio interfaces or MIDI interfaces other than the UNO connected to your computer? If so, try just unplugging them and relaunching the librarian software. If these suggestions don’t work, please email us at support@strymon.net and we can help out! @Kevin, we didn’t do any testing on Win8 but there really isn’t any reason it should not work. We’re actually in the process of going through some Win8 testing now. Love the app, guys! Super easy to use and works like a charm. Thanks! Can’t wait to try this thing out! I’m having some trouble using an Axiom 49 as the interface. It’s doing a call and response but comes back “unknown”. Tried to upgrade the driver but turns out it’s class compliant and has none. I’m running OS X 10.8.3. OK, turns out the Axiom doesn’t pass Sysex thru to the MIDI out. The response I saw was the Axiom, not Timeline. Damn. Time to get a proper MIDI interface at home. I’m trying to contribute to this project, I have checked out the source from Github, and I’m using Windows 8 and Visual Studio 2012 + QT 5.0.2 (all x64). But I just can’t get it to build on VS.
wondering if someone over there could maybe offer some help? Thanks guys. I managed to fix the project meanwhile, VS2012 was deleting 3 .cpp files on its own when building, and removing them from the project (?!?). This is probably some glitch by VS2012 when converting the VS2010 solution file. Anyway, it now builds and runs normally. So, thanks for being available, I’ll mail later if anything else comes up! rgds. Hey guys! New version is up! Thanks very much. I used it with the lexicon Ionix 8-channel and the Mobius. The Mobius is just what I needed. We play a lot with click tracks and now the PC can keep the Mobius in time-phase with the rest of the band. A MUST when it comes to patterned chopper sequences and other tremolo patterns. What about an editor? When will we see something? so, do we know of anyone that has tweaked with the open source code yet and made anything cool from the original offering? @Patrick, I’ve talked to one gentleman who is working with the code so hopefully he has something to offer soon! Hi, if possible… the EDITOR please. A must have for a piece of art like the Timeline. Best regards from Brasil. Just wanted to say thanks SO MUCH for this. I use a silly large OC-10 midi/loop controlled board and this saves me so much time and frustration in setting up all my settings and midi program changes. Oh, and it works great with an M-box 2 in case anyone was concerned about that. Hi Rick, Ive tried installing my Uno One multiple times now as well as Strymon librarian. I still get a no response on the test tab. Any ideas would be helpful. I am absolutely stoked you guys are opening up your software to developers! I like Strymon more and more as a company. Now if you had Linux support, I would be all over this (in terms of development) as well as purchasing your pedals (when I’m not as broke as I am). Hi, I have just updated to Mac OS Mavericks & SPL no longer opens, any clues to if you have to do something to SPL to get it to run? @Lewis, SPL isn’t compatible with Mavericks just yet. We’re actually in the process of testing a build though so it shouldn’t bee too long before we have a release that supports it! @Nick Farlight I don’t have anything new to report on the editor front. We’re still working to improve some internal things with the librarian to make it as robust and solid as we can. I don’t actually see an editor being released for a little while. I’ll make sure our software engineers see your request though! I hooked up a MAudio Uno Midi cable today and downloaded the librarian software and everything works fine. I can edit names of patches and move them where I like. I look forward to utilizing the EDITOR to tweak parameters and having the ability to share patches with other users! ETA on EDITOR? I am having troubles with Librarian. I am able to connect to the device and fetch the list, however when i try to sync my changes up it says unable to connect to the device. Anything i can do? I just updated the firmware on my timeline, so that should be fine. I am having the same issue as Daniel is having above. I am able to connect to the device and fetch the list, however when I try to sync my changes it says unable to connect to the device. I have looked at the above mentioned trouble shooting tips, but cant seem to find a fix. I am using the Innovative Interfaces MIO as a MIDI to USB interface. @Dale That MIO USB interface that you are using is not a recommended interface as I mentioned in my email to you, but I’m glad that you were able to get it working using the IO preferences that I provided you. especially if you could daw integrate. I’m using an alesis usb/midi cable. I can fetch my preset list, and midi settings passes test. I’m able to backup my presets but i’m unable to upload presets, or update fw. Would this be because im using the alesis cable as my interface? @danny serrano – That problem is likely due to the MIDI interface as a lot of those and other plug-and-play type of MIDI interfaces may not be robust enough for the communication back and forth between our pedals and librarian. Shoot an email to support@strymon.net so I can give you some suggestions that may get that working. 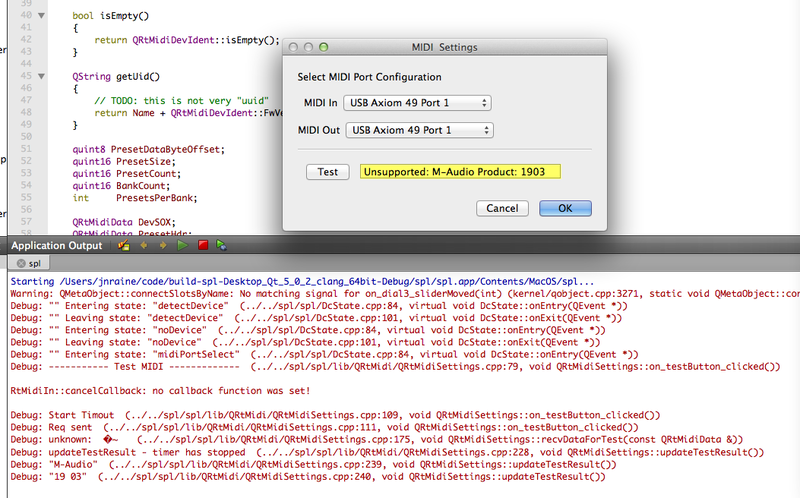 What were the I/O settings that worked for the MIO USB interface? I’d like to see if they work for me before I try a recommended USB. @Hugo, can you tell me why the MIO doesn’t work well with the Strymon TImeline and Big Sky? I am using Windows 7 on a Dell laptop. I get the error “Unable to communicate with the device” when attempting to sync in Librarian. Thank in advance! @Kevin – A plug-and-play interface like the MIO doesn’t have drivers that were developed for the specific operating system which may be why it doesn’t just work. Try the suggestions I provided to Holland to see if it helps you with syncing your changes through the Librarian. @HUGO, YOU are brilliant! That worked like a charm! Thanks! Second the Linux support request. I’ve reset to factory setting on the TL… I just bought it and the sharing patches is a must have for me. Working on building the sol with QT to turn on the debug prints. hello. I’m trying to edit BigSky v1.1.9 with Librarian v0.939. But I get the error “unexpected data after preset write” when attempting to sync in Librarian. No problem occured as I edited TimeLine and Mobiusin same way. Would somebody give advice to slove this error. @Josh – Sorry to hear you are having trouble. In the BigSky GLOBLS menu (press and hold VALUE for a few seconds), set the MIDI TH parameter to OFF as this can send data back to the Librarian software prompting this message to appear. Please email us at support@strymon.net if you continue to have trouble. So I just bought the cheapest Midi to USB interface that Amazon sold ($6 from China) to update my Timeline and BigSky… but they don’t connect. Is there any way to remedy this or am I gonna have to buy a new interface before I can update? @Jonathan – In our testing, we have found that inexpensive cheap interfaces like what you describe are not very robust to handle the data packets in the communication between our pedals and the software librarian. We recommend a dedicated MIDI interface with developed drivers for your computer’s specific operating system such as the Roland UM-ONE and Yamaha UX-16. Has anyone been able to get this working through NI Maschine Studio? I keep getting a no response error when I try the midi test. @James Wallace – In our experience, we have seen MIDI ports on audio interfaces or other non-dedicated MIDI devices may not be robust enough to work with our pedals and the Librarian software. We recommend dedicated MIDI interfaces such as the Roland UM-ONE or the Yamaha UX-16. I am having an issue getting the computer and timeline to communicate through my midi cable. I have all of the In/Out and USB ends of the cable connected properly, but whenever I test it I get “no response”. What am I doing wrong? Also, feel free to email me at support@strymon.net for further help.